Weird Wiki: How Much Would You Pay For The Corpse Of A Fairy? 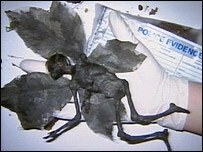 In 2007, an illusion designer from the UK put up for auction what appeared to be the remains of a dead fairy. The winged creature was said to have been inspected by X-Ray and proved a biological organism. Although the bone structure seemed to be that of a child, the bones themselves were said to be hollow. The exact day of the posting should have been a tip off, so skeptics found it as no surprise when the April Fools Day hoax was revealed to be nothing but a model. However, even after it was revealed as a fake, the curiosity still sold for £280 to a private art collector. Messages still poured in after the confession, with many upset that the seller listed the location where the fairy was found. You are currently browsing the archives for the Weird Wiki category.